If you’re employed in the electrical construction field in York or Adams County Pa and you would like improved wages and benefits, more job secuurity, and a voice in your workplace please read on! As Union Members We Live Better! As union members, we negotiate collectively with our employers over wages, benefits, and rights on the job. As workers we have the best chance of receiving better wages, benefits and fair treatment in the workplace by bargaining collectively as a union. Workers have very limited bargaining power as one person, but as a group, we are strong. And, with a good negotiated contract, we have legal protections we would not have otherwise. Under the employment at will doctrine, the cornerstone of American employment law, in general terms, unless we belong to a protected group, our employer has the right to discipline or terminate us, with impunity, for any reason -- even a bad one -- or for no reason at all. That's why it is sometimes called the fire at will doctrine. If you look in your Employee Handbook at the non-union employer where you work, you will find the Employment at Will section in the first few pages. With a collectively negotiated contract we have rights. Management must have "just cause" for any disciplinary action taken against a union member. "Just cause" is spelled out in union contracts so that workers know what is expected of them. EVERYONE KNOWS THE RULES WITH AN IBEW CONTRACT! An IBEW Contract is an agreement between the employer and the employees (us). It sets the wages that will be paid for each job. It lists the holidays and the terms of vacations. It guarantees such things as insurance and retirement. It sets up a system for settlement of complaints or grievances. The contract also provides for such things as sick leave, jury duty, funeral leave, military service, hours of work, overtime, safety regulations, conditions of employment and benefits we shall receive. IBEW contracts are alike in principle but they vary from employer to employer to suit both local conditions and the desires of the employees. There are a couple of ways to become an IBEW member. One way is to organize your workplace where you are currently employed. The union IS the people who belong to it…we are all working in a common industry and need to stick together to ensure good standards for the electrical industry as a whole. Most workers don’t realize that they have the legal right under federal law to form, join, or assist a union in their workplace without fear of threats, coercion or intimidation by the employer. It’s your RIGHT in this country to form or join a union of your choosing! It’s not up to the boss or owner its up to the workers. This is accomplished through a National Labor Relations Board election. The process is simple and IBEW 229 can organize the campaign and assist you every step of the way. A secret ballot election is conducted by a federal agent of the NLRB. If the election determines that 50% + 1 of the employees want union representation then the employer is BOUND BY LAW to negotiate a contract!! We have many years of experience helping workers organize their workplace. Workers have many more rights than most are aware of, and the boss doesn’t want you to know! Contact Us for information on IBEW representation. 1. Union guys are laid off all the time! Well unfortunately lay offs are a possibility in the construction industry. But this issue has been used as a scare tactic with great success by non-union employers to intimidate workers about the IBEW. Truth is that IBEW electricians are laid off no more often than any other workers in our industry. We use a referral process to refer our electricians to our signatory contractors. Our electricians do not rely only on one contractor; they have the option of working for dozens of different contractors working on many different types of projects. Approximately 2/3 of our members work long term with one company, the balance of our members work for various contractors for various lengths of time. These jobs may be weeks sometimes years depending on the type of project. IF an IBEW 229 electrician becomes unemployed due to lack of work or he/she quits a contractor to seek another type of job with another contractor he/she signs our “out of work” list. When our contractors need manpower they call IBEW 229 and we refer our electricians in order from our Job Referral List. They start with a new contractor at the SAME hourly rate and benefit package!! Being an IBEW electrician you no longer only rely on one contractor, you have the option of working for literally dozens of contractors in the area at the same wages and benefits with each one. 2. Union Electricians “travel” all the time to work. IBEW Local unions have geographical “jurisdiction” that they are responsible for. 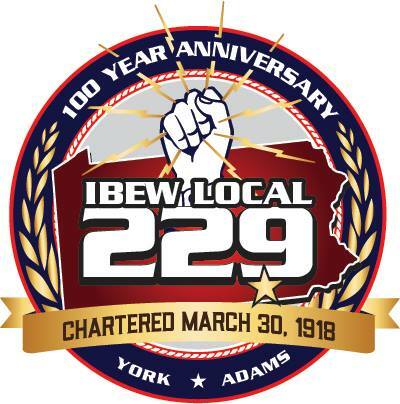 IBEW 229’s “jurisdiction” is all of Adams County and most of York County Pennsylvania. Our members work the vast majority of their time in south central Pa. and in fact in York county. Our affiliated contractors do bid work in northern Maryland, Lancaster, Gettysburg, Harrisburg and other areas but the vast majority is here in the Greater York Area. If a contractor has you working outside of the jurisdiction of IBEW 229 you are either provided transportation or paid mileage. If work slowsdown in this area you as an IBEW member have the opportunity to go to work in other IBEW Local Unions that need manpower. When you do, you receive the wage and benefit package applicable in that Local Union. IBEW referral systems refer Local members fist, then “travelers”. A traveler is a member from ANY other local union. For example, a member from IBEW 143 Harrisburg may be working here in IBEW 229 and is referred to as a traveler because he is not a member of IBEW 229 but he lives nearby in the Harrisburg area. Travelling is not a common occurrence but if work is slow locally you can seek work in other local unions who are busy. Being located here in the north east US you can usually find work within commuting distance of home. Again, the advantage of being an IBEW member is you have access to hundreds of contractors to work for. If the company you are working for slows you now have options and don’t have to start at the bottom again with a new contractor. 3. The "entry test" is too difficult, and I’m not doing an entire apprenticeship. The exam that is given to electricians at IBEW 229 is used to determine the qualifications of an electrician. It is NOT a pass or fail "test". The IBEW has multiple classifications of electricians and an individual will be placed appropriately with their skill set. New members can then take task specific training, provided by IBEW 229, and each year gets a 10% increase and ultimately becomes an IBEW inside journeyman wireman. This method provides an avenue for electricians not matter what your experience level or background is to become an IBEW member, reap the benefits, earn a great hourly rate and get annual increases and also have access to course specific training that might not have been offered in a non-union apprenticeship. 4. The union hates the contractor and complicates things for them. Nothing could be farther from the truth. We work very closely every day with our contractors to make them as successful and profitable as possible. The more successful they are the better wages and benefits we can negotiate. We negotiate a fair, competitive agreement that sets out the rules for both parties, fairly. We can only negotiate good wages and benefits if we are productive, efficient, and professional. 5. Union dues are high. A local union needs funds to operate just like any other organization. We fund our local by paying union dues. These funds are established by the membership at a union meeting by majority vote. We ALL pay these dues and obviously want to keep them as low as possible. IBEW 229 is the most democratic organization you will ever be a part of and each member has a voice and a vote. Everything done is approved by the body. IBEW 229 union dues have not increased in over 10 years because we are fiscally conservative. Local 229 journeymen make over $30/hr. That’s IN THE CHECK. On top of that they get an over $16/hr benefit package including full paid family health coverage , 3 pensions and an annuity plan. How much less do you make….that amount is the NON UNION dues you pay!! 6. My employer will fire people if we try to join the union. Organizing a union in your workplace does seem intimidating and can seem like such an uphill battle that it seems impossible. Well it does take guts but IS very worth it and thousands of workers do just that each year. Its illegal for an employer to threaten, intimidate or coerce workers exercising their right to unionize. However many employers will illegally do just that. That’s where the experience the IBEW has in organizing comes in. There are ways to minimize this possibility and in the event that an employer violates the law the full resources of the IBEW will be brought to bear on them. IBEW 229 will support workers who want union representation, we will ensure that no matter what happens during an organizing drive that workers will be brought in to the IBEW and put to work. There are many more “misconceptions” out there. Do yourself a favor and find out the FACTS for yourself!! !